As I peered out into the night sky last night, I smiled at the inky darkness and thought what a sleepy little town I live in. An occasional beam of light shot through the air as commuters returned home after a long day at work. Breathing in the nocturnal dampness, I wondered how such a place could also be a showcase for so much stress: not externally, mind you. But internal turmoil can be found even here. I began an inquiry as to how big our stress box needs to be to handle the daily demands of modern living. Even in as pastoral a place as this cow town that I’ve called home for ten years, I wondered what it takes to push the limits of that stress box to one in which you never touch its sides. What is required to leap from the box into a state of peace and calm? We all have stress boxes of various sizes. Some of us touch the sides of our self-imposed cage rather quickly. We hit the edge, explode (or implode, depending on your nature), and lash out about us. Others rarely touch the sides of their box, having recognized how much room they need to expand and contract with ease. Lately I have seen the sides of my stress box a tad too often, but once I recognize that it’s a box of my choosing, the sides seem to vaporize like an apparition of my own imagination. Some days we climb buildings in a single bound. Other days we can barely raise our heads off the pillow. Life can get overwhelming at times. When everything seems to be happening at once, know that you can only do so much. For the past week I have blogged in my head a hundred times. And I’ve missed it. A lot. 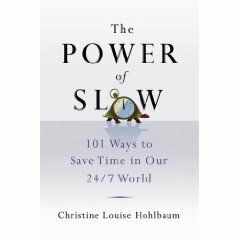 I am in the process of doing some back end work on this site to serve you better and to spread the word more easily about the Power of Slow. And yet, it seems, there are forces at work that have set me back from my desire to improve this blog even more for you. As in all things, there is a gift to be found in setbacks. We often want things yesterday, as if now, or even tomorrow, isn’t soon enough. We get frustrated when our computers don’t boot up “fast enough”, when the person driving in front of us is “too slow”, when our loved ones don’t answer our emails/phone calls/text messages “right away”. But it takes time to let things grow. They must first germinate, then grow roots, then push themselves slowly out of the ground. Only then can they come into full bloom. So if my blog has yet to have the beautiful character I wish it to have, know that I’m working on it. That is the lesson of Now. Two days ago I was cruising up I-8 on my way to Phoenix from San Diego to pick up my mom at the airport. If you have ever driven out West, you will know how straight and narrow those highways can be. You can go 100 miles without really seeing civilization. With good tunes on the radio and a bit of mindlessness, it is easy to go a tad over the speed limit. It is embarrassing to admit to you that, right after a pitstop in Yuma, AZ for some breakfast at IHOP, I was pulled over by one very nice Officer Sanchez for going too fast. He asked me where I was going, where I am from and what I do for a living. I cheerfully explained that I had had a spiritual prompting and was on my way to Sedona. Admittedly, I thought the spiritual angle might soften his heart. And I told him how ironic this all was, given I am the author of The Power of Slow. I giggled to myself all the way to Phoenix. Thank you, Officer Sanchez. You are right. Slow really is faster. Eckhart Tolle teaches us about the Power of Now in his book of the same name. Now is all we have. So when you find yourself saying “Some day I’ll do this or that,” know that some day is now. When I was a kid, my cousins went on a safari to South Africa. It was such an impressive experience that my aunt and uncle dedicated an entire room to the photos they made. They aptly named it The Safari Room. From that day forward, I told myself I too would take a safari ~ some day. Life doesn’t always allow us to immediately implement our some days into a single day. But when you see an opportunity to live your dreams with some day in mind, you had better go for it. When my dear friends in San Diego told us about the Safari Park near their house, I saw an opportunity to live my dream ~ even if it wasn’t the South African plains, it was filled with the same animals my family had seen years earlier. When we put off our dreams in the name of security, safety or assurance, we are often shortchanging what could be the most transformative experience we could have in our lives. If you want to do something, do it. Trust me. It will be worth it! The other day we took an open air van to an area where giraffes, rhinoceroses and other exotic animals roam in near-native conditions. I got to feed several of them and I must say it was, apart from giving birth to my own children, one of the most moving experiences of my life. Yes, I was terrified, but I did it anyway. 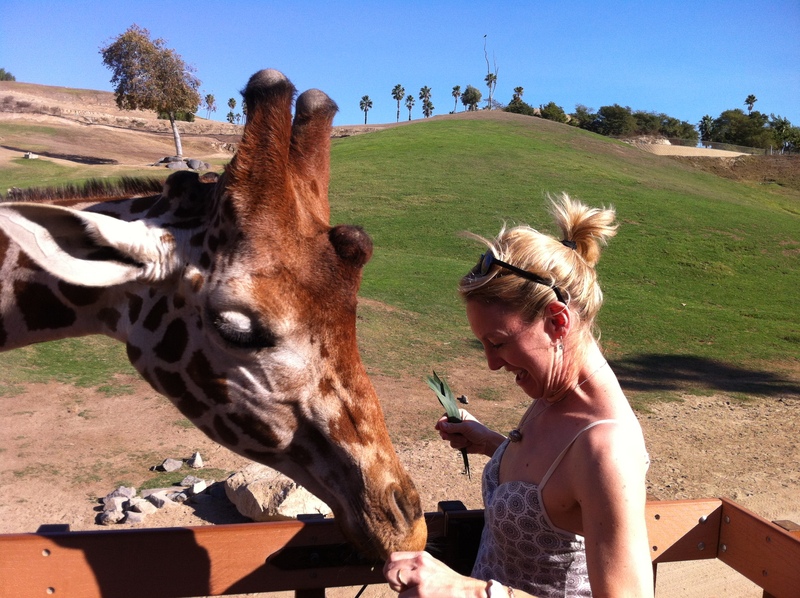 I held fast to the dream of taking a safari and there I was amongst very safari-like animals on a beautiful day in Southern California. Some day is now, people. If you have a chance to live one of your life’s dreams, do it. It will bring you to higher heights and empower you to live the life you’ve always wanted. Forget the excuse as to why you cannot embrace every moment in all its preciousness. Your life is always happening in the NOW. What will you do with it? The bracelet was perfect. After searching from Paris to Alsace to Tuscany, I finally found the jewelry that expressed one of the most important summers of my life. You see I am not a collector, really. My best friend is the one who collects things. As a teen she collected crystals. Later she took a liking to charms. 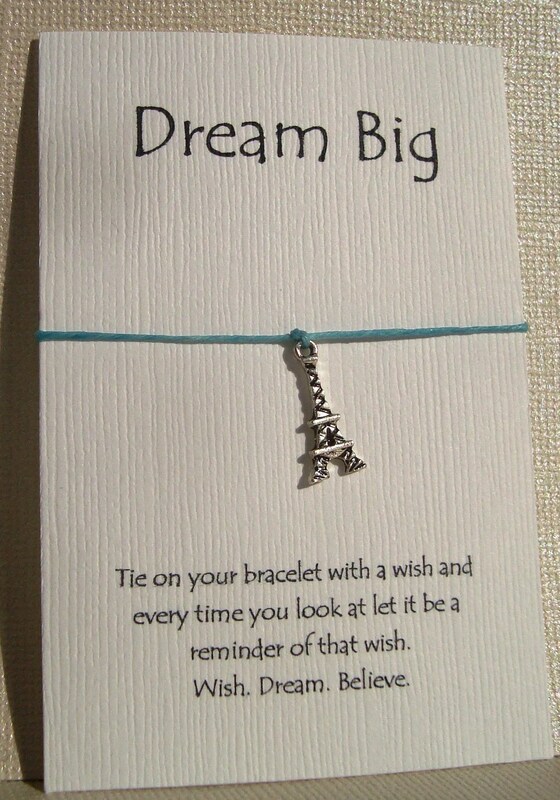 So whenever I would travel, I would bring her a charm from the places I had been: the Parthenon in Greece; the Eiffel Tower in Paris; the Brandenburg Gate in Berlin. Until one day her bracelet grew so heavy, her arm could no longer support it. Infused with the need to find something similar, I looked everywhere for a new charm bracelet, but it seems as though the charm makers had gone out of business. No matter where I went, I couldn’t find any. That is, until I reached our final destination on our week-long tour of Tuscany in a small town called Lucca. There lay two charm bracelets in the window with exactly the charms I had been searching for. The place was so tiny we had to stand still so as not to touch the walls. With an open face and a kind smile, the shop clerk was incredibly friendly. In our broken Italian we asked for a good place to eat. She called around to her friends, but none of the good places were open. She was the most, well, charming person we had met along the way! Sometimes we find what we are looking for in the most unexpected places. If we search too hard, we may not see what we need to see. 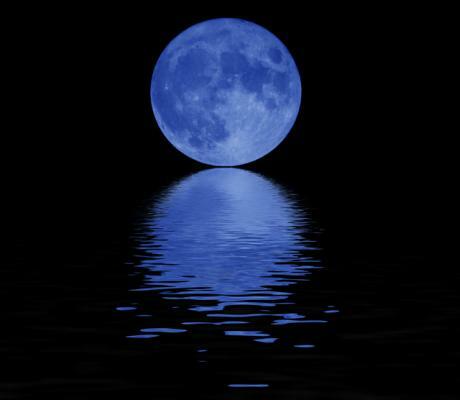 With relaxed eyes and a calm spirit, we are better able to perceive what we are meant to see. In which ways have you been charmed lately? Life can be spell-bounding, if you let it. Open your heart and look at the world through its eyes. You may find that everything you’ve been looking for is right in front of you.